OBEY, Guerilla One, and The Seventh Letter have always had a strong long-lasting friendship and creative relationship with numerous collaborations including the late 90’s Free GKAE print, created by Shepard and Casey Zoltan from The Seventh Letter, to raise funds for GKAE’s legal fees. This current project was created to symbolize both strength in numbers and unity by way of collaboration. 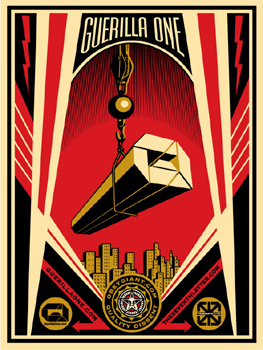 The Seventh Letter, Obey Giant, and Guerilla One have all stood individually and collectively as pillars in the graffiti /street art scene both domestically and internationally. Its apparent that the 3 collaborators will continue to support street art by creating new platforms that encourage and inspire many worldwide. I met Eddie and Casey in the late 90’s around the time I started coming from San Diego to LA to put up posters. Casey’s Seventh Letter Crew had all the best graffiti spots, and Eddie was promoting the scene through his website Guerilla One, and promoting the website through obsessive sticker bombing. I’ve met too many cool people to name through these guys and it is always a pleasure to work with them. I’d say “stay up”, but they need no reminder. -Shepard “I have always rolled with G1 and Shepard through thick and thin and will always have their backs forever on a street and professional level”. - Casey EKLIPS Zoltan, Founder of THE SEVENTH LETTER “When we started doing graffiti, putting up stickers we had no idea the places it would take us, and no matter where we go from here we will stay loyal to those who have helped us get there.” - Eddie Donaldson, Founder of Guerilla One This print is an edition of 450, 18 x 24, $45 and Signed by Shepard. If you can’t get them on OBEY be sure to head over to www.madsociety.com today, 3/11, as a 100 Prints will be available for sale there!